This article is a part of my (as yet, unpublished) book mainly addressing cargo handling on OBO and tankers. It is concerning the underestimation of a pressure surge in the piping system and aimed to demystify the subject. I hope it will be useful for cargo and deck officers as well as for jetty personnel. We were discharging cargo of gas oil in Panama. Our vessel had 10 cargo tanks and was equipped with 10 Framo deep well submerged pumps. Manifold pressure on the ship's side of the 10" manifold was close to 5 bar. It was simple discharge from all tanks at once. After a few hours we were called by the loading master and informed that he needed to stop cargo operations straight away and expected to resume in 5 minutes. We had reduced the rate of discharge to the minimum, say 180m3/hr. At this point the manifold pressure was approximately 1 bar or less. Then all pumps were stopped more or less at the same time. The manifold remained open as we were ready to resume. After a few seconds the manifold pressure jumped up to 10 bar. As you can see from the table, this was easily predictable. That was my first lesson. I also recall when one of the ballast valves was observed cracked. The history records revealed that the same valve was changed 4 times in 4 years. That was my second lesson. ISGOTT Chapter 21 gives a brief explanation of this as it describes the "phenomenon" and discusses the ways in which it can be prevented. It is pointing to unlikely events leading to it, thus gives us a false sense of safety. However, we should understand that it is not a "phenomenon" but a law of nature and be aware that it is all around us. It is present in each stage of cargo and ballast operations, flow change, starting/stopping pumps, opening/closing valves. Misconduct of such routine operations will result in damage to pipelines, machinery and other connected equipment. It should be stressed that any pipeline system, I repeat, any one, is liable for more or less severe pressure surge. So what is a pressure surge? A pressure surge is an abrupt increase of pressure in the pipeline system when there is a sudden change in the rate of flow of liquid in the line(s). It reaches its maximum when the flow is stopped. The main reason for the increase of pressure is the transformation of kinetic energy of the flow to the potential energy of the liquid brought to rest. When the rate changes, a steep pressure front travels through the pipeline with the speed of sound in the particular liquid. Pre-calculated results were composed in a table. This table should alert you. It is easy to use. 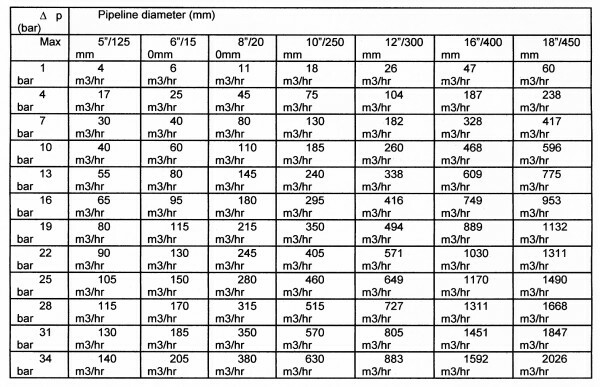 If you have a 10" pipeline and the rate of flow suddenly changes by 300m3/hr then you will obtain pressure increase up to 17 bar. It means that the total pressure in the system will be equal to the system pressure at the moment of the change of rate plus 17 bar. One question should arise after the careful reading of this article. How much time do we need to spend for rate change to reduce the pressure surge to predictable minimum. My next article should be the answer. My report/comments are not exactly what usually appears in your excellent publication. However as it is difficult for serving seafarers to get their concerns debated, I thought I would forward it to you in the hope that you publish and open up a debate on a subject, which I and my colleagues think has not been given enough thought. The subject is the conflicts which exist between the reports which have to be made to the various VTS and Port Authorities throughout the world and the need for Information Security as required by the ISPS. We recently received on board an Advisory Note from the Company referring to one of our company's ships being censured for failing to report to a VTS as required. This has reopened the debate concerning information that has to be passed to VTS schemes and the need for security which has been discussed many times onboard over past few months. There is undoubtedly a serious conflict of interest which has never been debated, most probably because the IMO, PSC authorities, USCG etc do not even realise that it exists. The information required from the ship by the various VTS throughout the World varies but is extensive enough in all cases to be of great use to potential terrorists and pirates everywhere in the World. VTS Reporting requirements are in effect a free information service for those who would use ships for illegal purposes. All they need to do is buy a Marine VHF and park themselves on the White Cliffs of Dover or the leafy beaches of Malaysia and the local VTS will find out most of the information they need to help them attack a ship in their area absolutely free of charge. One of the main points emphasised in the training for ISPS was information security and the need not to discuss ships business in pubs, restaurants and other public places. Yet on a daily basis all over the World information is being given out freely on open channels to which everyone and his brother can listen. Of course with the introduction of ISPS code every potential anti-ship terrorist and every pirate from Rio Haina to Vladivostock must have jumped with joy and given eternal thanks to whichever God he purports to worship. Why? Because now every ship was to be fitted with an AIS machine to give its exact position. Now not only do they have detailed information concerning the ship but they no longer have to search to find it, they have a machine to show them. Previously, when in known dangerous ports in West Africa and South America, I used give VTS/Port Authorities deliberately false positions and the ship would be many miles from where I said it was. Now there is no point, the local pirates can track my ship without problem after having received all information about the ship from my call to the VTS. That, however, is not the worst of it. Not only can an AIS be used for tracking a ship, it can easily be programmed to "impersonate" a ship which greatly increases its potential as a terrorist weapon. I cannot buy an AIS from a duty free shop in an airport yet, but within a year or so they will be available. However, I bet that the terrorist groups already have access to a supply. It is a ludicrous situation and one that needs a much wider debate and efforts to find more secure ways, if it is really necessary, of relaying information to VTS reporting points, port authorities and the coastguard. Since receiving the Company Advisory Note, I have obtained a recent edition of "Fairplay Solutions" and an obscure, but very interesting publication called "Digital Ship" which I admit I had never seen before. Nothing I read in either makes me feel any easier. Indeed in "Fairplay" the head of the IMO Navigation & Security department is advising owners to prepare to fit a Long Range Tracking & Identification system by July 1st 2006. So not only will potential terrorists and pirates have all the information they need, we will be forced to carry a machine that will give them this information much more in advance so they can prepare their schedule much more efficiently. Whoever creates these schemes may think that they will be secure but of course they will not. In my 24 years as Master, my ship has been subject to "pirate attack" on quite a few occasions in West Africa, South America and the Far East. On every occasion the thieves new exactly which container to open, they never had to search, they knew the contents, I did not. The only way for real security is to shut up, physically and electronically, until such time as we have guaranteed secure communications. I recently had an interesting discussion on the bridge of a cruise ship with North European Deck Officers. As with many other such vessels, it is common practice to proceed sufficiently far from shore to discharge food waste and grey water (Outside a special area! Ed.). Passage times are often so short that much of the time the main engines are stopped and, once the discharge of waste is completed, the ship drifts until it is necessary to resume the passage. The Master stated that he required the "Not Under Command" (NUC) lights to be exhibited while the ship was drifting. Many of these vessels exhibit NUC lights while drifting. I queried the legality of this and suggested that stopping by choice did not make the ship "not under command" as defined by Rule 3 (f), which requires the inability to manoeuvre due to some exceptional circumstance. The Master insisted that the ship was not under command if the main engines were not available immediately, whatever the cause. His concern was that, with the engines stopped, the ship would not be able to manoeuvre to avoid a collision. The obvious answer is to have the main engines available at sufficiently short notice to enable any necessary action to be taken. If stopping the main engines places the ship into any danger, they should not be stopped, or at least be kept at instant readiness. A discussion followed and a copy of the International Regulations for the Prevention of Collisions art sea was produced. Rule 3(i) defining a vessel underway seemed clear enough as did Rule 23(a) defining the lights to be exhibited by a vessel underway. Whether the vessel is making way or not is immaterial. The question of whether or not to extinguish the side lights once the vessel was no longer making way then arose. The officers remained divided in their interpretation of the requirement to show side lights if not actually making way and, to settle matters, sought the opinion of their National Maritime Authority. The reply is interesting and the last sentence conflicts with my interpretation of the Rules. Reference is made to your e-mail of……… with questions of how to read Rule 27. Please note that the definition of a vessel not under command" is given in Rule 3 (f). If you have stopped your engines just to kill time, with the engines ready, the NUC lights should not be exhibited. The normal running lights should be shown. If the ship does not make way through the water the sidelights should not be exhibited. I hate to disagree with a Senior Principal Surveyor, buy I do not agree with the statement that side lights should be extinguished if the vessel is not making way through the water. As I read Rule 23(a), side lights should be exhibited by a normal power driven vessel under way. As a lecturer, preparing candidates for their MCA Oral Examinations, this is what I taught. As a final thought, the prospect of half a dozen cruise ships, each carrying around two or three thousand passengers, all drifting in relatively close proximity off a port, arouses some concern, especially if they all consider themselves to be Not under Command. The following is advice from The Britannia Steamship Insurance Association Limited published recently in their RISK WATCH publication. Most mariners are aware of the dangers of carrying copra. Recently a Master on board a Member's ship was alarmed when he saw what he thought was smoke rising from a part-loaded cargo of palm nut shells. The Master had also recorded steadily increasing cargo temperatures and when the cargo reached 60°C he ordered loading to be stopped. His concern was that the cargo might spontaneously combust. Local Correspondents in Indonesia advised that this was the first time this cargo had been shipped and they therefore had no experience of it. Overnight the cargo temperature increased by a further 20°C and it was decided to take advice from an expert surveyor. Although neither the surveyor nor his colleagues were familiar with the cargo it was ascertained that the cargo was not classified as dangerous under the provisions of the IMDG Code. The cargo had been stored in the open in strong sunshine and wetted by several heavy showers. It had begun to heat up as a result of microbial growth. This process produces heat and steam (as the moisture in the cargo is driven off by the heat) but is not, strictly speaking, spontaneous combustion. Although temperatures can reach 80°C and ship Masters should justifiably be concerned, the temperature will usually plateau at that level and will not rise further unless there is a high fat/oil content in the cargo which may cause a further reaction and cause temperatures to rise again to the point of ignition. Analysis revealed that the oil/fat content of the cargo in question was below one per cent and therefore the risk of self-heating to ignition was very remote. In addition, because the cargo was intended for use as fuel, there was no risk of the microbe generated self-heating affecting the merchantability of the cargo. During the voyage temperatures in all the ship's holds declined as oxygen was depleted and CO2 levels rose. After precautionary ventilation of the holds to release any trapped steam/vapour before berthing, the ship completed discharge uneventfully. The Association has had no previous experience of this cargo and whilst the cargo has all the hallmarks of the potentially dangerous copra cargoes, it does appear to be safe by comparison. One of the most important lessons from MARS over the years has been the tragic and often fatal failures of lifeboat release mechanisms. I am very pleased to see that this problem has now been addressed by Survival Craft Inspectorate of Aberdeen. They have designed a new release hook that will be much safer and easier to operate without the need for complicated instruction manuals. RB.